When travelling abroad, it is always wise to remember that accidents can happen to even the most well prepared traveller - that's why they are called accidents! In reality, the most you can do to head off an accident is prepare for one, and minimise the behaviours that could present a risk. If you do have an accident while abroad, remaining calm throughout is imperative. Remember, accidents are scary and frustrating when they happen at home, but even more so when they happen abroad. No one wants to jinx themselves, but preparing and packing for an accident or injury during your gap year trip is the only way you can be sure you will have supplies ready if they are needed. Before you travel organise all of your medical certificates, prescriptions and insurance papers, and obtain insurance claim forms to carry with you. Enter the local number of your insurance company into your mobile phone along with the numbers of your embassy. Creating a portable first aid kit is a must for any traveller and can prove vital in any emergency big or small. Stock your first aid kit with; pain relievers and fever reducers, wound and blister ointments, hand sanitiser and hand wipes, antibacterial spray, antihistamine cream, plasters, gauze, surgical tape, scissors, safety pins, tweezers and a lighter. Often during their gap year, travellers engage in a variety of activities that they would not normally have the chance to participate in at home. Gap years also provide many environments that are not common to travellers. To help avoid accidents and injuries during your gap year, remember to; avoid clambering over mossy rocks or stones, do not wander through running water, even if it only looks like a stream, travel with others at all times, invest in a guide to take you to remote locations and sites. Ask for instructions when using new tools or equipment and stay away from live wires or downed power lines. Only rent/drive a car if you are a trained and licensed driver and stick to main roads and bridges at all times. Never touch fireworks or weapons! Even relatively minor injuries can escalate, particularly in steamy, tropical climates. If you find yourself faced with any sort of injury, deal with it as best you can but always seek professional medical advice at the nearest opportunity. Clean all wounds with bottled water, ointment, antibacterial spray or even hand wipes. Cover all open wounds with gauze to avoid dirt or even insects getting inside. Removed embedded objects (such as splinters) with sterilised tweezers. Sterilise "tools" by running them through a flame. Dab all insect bites with ointment to avoid infection. Avoid putting weight on strain or sprain injuries. Elevate swollen feet, ankles, hands, wrists and elbows. 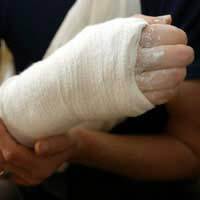 Try to keep suspected broken bones steady. Request an English speaking nurse or doctor, if needed. Call your insurance company's local number for further information and to make a claim. Alert your embassy to any major trauma. Accidents and injuries can certainly liven up a trip, but never in a good way. Keeping supplies with you at all times may be the best way to prepare for an accident or injury on your gap year, and who knows, maybe Murphy's Law will keep you safe - if you drag supplies with you across the world, you'll never need to use them!